N/Aredictable and consistent mechanical (stress-strain-time) behavior is the primary function of the TerraFlex elasticized geofoam. This product is designed for use in rehabilitating or retrofitting existing structures by adding additional safety against one or more geotechnical and/or structural failure mechanisms. It can be used in situations where compressible inclusion is required, is resistnat to insect infestation, will not contaminate the environment or decompose, and is recyclable. 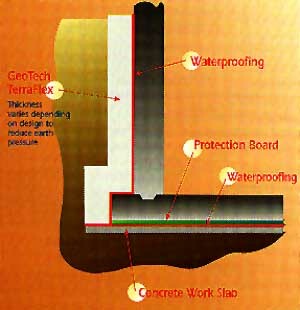 Additionally, the system is engineered to provide thermal insulation, as well as noise and vibration dampening. This product can be used in applications including retaining walls, bridge abutments, foundation walls, culverts, slabs on grade, and pipes.